It once graced the shield and spear-laden rooms of Melbourne's exclusive Savage Club but now a wooden ceremonial sculpture from Papua New Guinea has set a record at auction for a piece of Oceanic art. 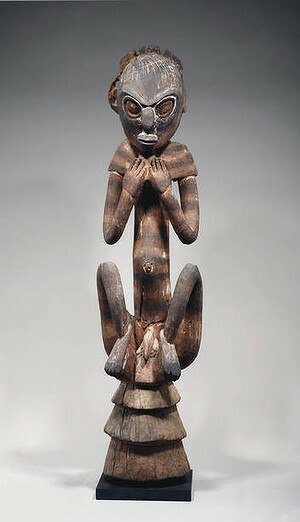 The one metre-tall "roof figure", carved by the Biwat people of PNG's east Sepik region sometime between 1600 and 1890, sold last week at a Christie's auction in Paris for $3.5 million, smashing through its estimated top price of $1.4 million. According to notes on the piece's provenance, the Savage Club is likely to have acquired the sculpture in the 1930s and sold it in 1977. It was ostensibly a time of "great financial hardship" when the money was needed for the club's extensive renovations. However Chris Deutscher, from auction house Deutscher and Hackett, remembered the decision to sell the sculpture was still contentious for some members when he joined in the late 1970s. "It really was controversial," he said. eventually donated it as part of the Jolika Collection to the San Francisco Museum of Fine Arts. Biwat sculptures were incredibly rare, said Robert Bleakley, a former Sotheby's Australia chairman and collector of PNG art who once evaluated the Savage Club's collection of "tribal" art. "Small population, loss of other items over time and the fact that any such works that have previously come up have been sold in to institutions and therefore don't come back on to the market," he said. "It's the power of the object, the force, the sculptural values. You could find other objects of equal age and of roughly similar appearance which might sell for a lesser price – so people really do identify and recognise the individual sculptural quality in these sort of works." In a statement, Christie's said the sale marked a new world record for art from the region. The auction house's specialist in African and Oceanic art, Charles-Wesley Hourde, said only a dozen figures of this kind were known to experts. "Three are of comparable quality and are all part of museum collections," he said.